I think that this is genius marketing. Not only does the buyer get a cool little shoe, a shoeless child is helped in the bargain. 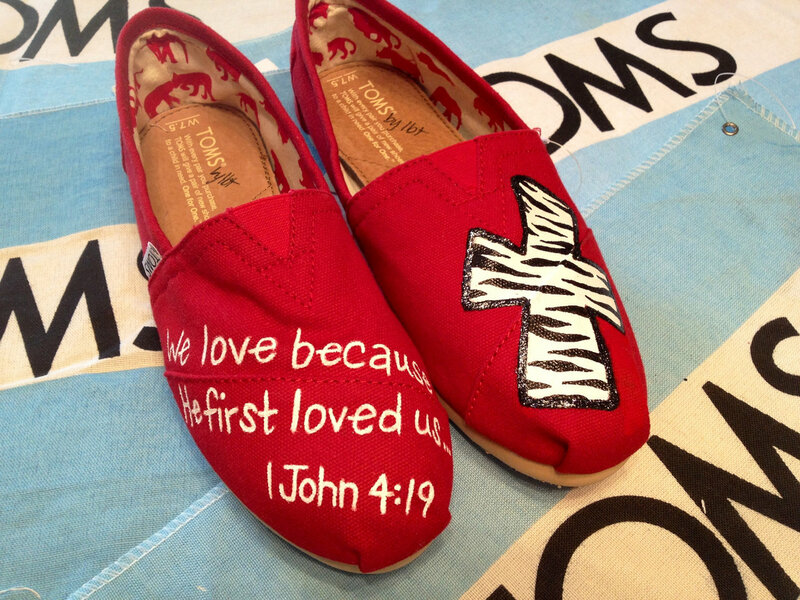 How about a custom-painted pair from Etsy with your favorite Bible verse? How do you like the pair below? Pretty cute with the black lace and leather trim, huh? As you can see, there is a pair of Tom's Shoes for every taste and budget. I've only touched the tip of the iceberg on what is available in a Tom's Shoe. EXCEPT…….. Did you see any pair that even remotely looked like a tartan Tom's? In all of my research on eBay, Etsy and Google, I didn't come across one single pair. UNTIL………. I got an email from my friend Judy, who was on a trip down in Costa Rica. Because I'm so obnoxious and overbearing about my love for tartan, all of my friends and family know of my obsession. As Judy was browsing in a local market, she came across the following and instantly thought of me. CAN YOU BELIEVE IT? The perfect pair for Miss Tartan Terrace! The following is a photo of the price tag that came on the shoes. As you can see, the price is 7,900 colones, which converts to about $16.00. That's what Judy paid for this priceless pair of shoes! But it begs the question: Why are we paying at least $50.00 in the States while the price in Costa Rica is only $16.00? Maybe the free pairs of shoes for the little shoeless children are being diverted from their original destination and are instead being sold on the black market? It would be interesting to find out. So that's my Tom's Shoes story. If you've never owned a pair, I hope that you'll consider it. They really are quite comfortable and also stylish in an odd way. But don't try to find a tartan pair in North America. I've got the only one and I'm not sharing. The tartan shoes are amazing - and how perfect for you! I've heard of Toms, and the fact that they give a child a pair of shoes when you buy one, but have never seen them (and I'm all about comfort!). A little distressing, though, to think the "free" shoes might be diverted. Hopefully not. Hopefully I'm wrong about that. BTW, you should drive down from Allen and visit Whole Foods or Whole Earth Provision Co. (if you don't have these stores "up north"). Both of these places carry lots of cute Tom's Shoes! If they sell them for $25, that's a good price. Sorry you can't wear them because they really are comfy! Well Kathy; you aren't the only ones in North America. I had to buy myself a pair as well. Then there was my team member from Australia who got the "other plaid" which was more blue in tone. But Australia is not N. America. We could start a club; just for two! Yes, we'll be in the exclusive "Tom's Tartan Club"! What size are you, Kathy? Because ---- I am coming over to borrow those!!!! One can hope that maybe in the fall edition??? on my blog to yours. Those tartan Toms are so perfect for you! Hi, do you know where in Costa Rica your friend found the Toms? Thanks! Best Brand Store on the town square in Ciudad Quesada. Good luck! Kathy, I had missed this until today when I saw these on your guest post at Alison's blog. I'm so envious of these. I've never seen them or you could be certain they would be in my closet too. Costa Rica??? ?